First ATV activity company in the Hawaiian Islands. Historical tour in area of King Kamehameha's birthplace. 15 mile adventure to private waterfall. Single driver and side by side 2 and 4 passenger ATV vehicles. Climb aboard an ATV for a 15 mile adventure to a private waterfall. Traverse through brisk mountain streams on your way to the entrance of a rainforest filled with native Hawaiian trees and canopies of ferns and flowers before discovering a private secluded waterfall. Your guide will paint a historical picture of the rich culture in the area. A visual rush of panoramic collages makes this a driving experience to remember. For guests needing assistance with a wheelchair or walker please inform agent at time of reservation so that you can be properly accommodated. Operates: Monday-Friday. 7:00am - 4:00pm. Check in 7:45am or 12:15pm. Departure Point: Hwy 270 just a little past the 24 mile marker, on the left hand side of the Hwy look for ATV Outfitters sign, take first left where you will see a refurbished cowboy cabin in the middle of a green pasture. Equipment: Single driver and side by side 2 and 4 passenger ATV vehicles. Each vehicle has different restrictions. See restriction section below and speak with agent for assistance. Capacity: 2-10 riders per tour. Fruit juice, ice tea, and bottled water are included. Inclusions: Guide, all necessary gear of helmet, goggles, gloves, riding instructions, refreshments and narration throughout. This tour is scenic and historical and not intended as a thrill ride. All participants over 16 are required to provide a valid current i.d. with their date of birth at the time of check in. If unable to provide ID at the time of check in, they will not be able to drive their own ATV and will still be charged for the seat. Adults must accompany any minors under 18 years of age. Passing, stunts and reckless maneuvers are not allowed. Guests must stay on the trail at all times. All drivers must pass the safety practice course to avoid being downgraded to a passenger. No price adjustment will be issued to those that fail the course. The minimum age to drive an ATV is 16 years old. Driver must weigh at least 100 lbs. but no more than 300 lbs. Must be 5' tall and wear long pants to ankles (No capri pants or leggings). The minimum age to drive the Side by Side ATV is 25 years old. Driver must weigh at least 100 lbs. and combined with passenger can weigh no more than 500 lbs. Must be 5' 4" tall and wear long pants to ankles (No capri pants or leggings). All participants are suggested to wear closed to shoes. Drivers must wear long pants but passengers may be more flexible and just dress comfortably. Cancellation policy is 48 hours up to 8 guests or 72 hours for Groups of 9-10 or more. This means that once you're within 48 hours, or 72 hours respectively of the start time, the tour is non refundable. If you choose to cancel before this time the standard 3% cancellation fee will apply. If the vendor needs to cancel your tour because of weather, a mechanical issue or any other reason you will receive a 100% refund of the price you paid. Departure times are subject to change. Due to the nature of our tours, scenery and weather may change without prior notice. Therefore, adjustments and/or cancellations may occur at any time. All of our tours and our headquarters are handicap accessible. 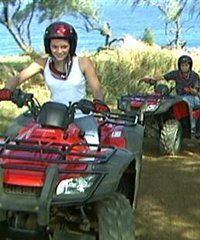 For the ATV tours guests must be able to have use of their hands to hold on to the vehicle. Wheelchairs and Walkers are confirmed on a case by case basis. Often wheelchairs need to be left behind and guests must be able to maneuver transfers to the vehicles. Guests will be advised if they must have others in their party to assist them in order to participate. Agent will assist you at the time of booking. 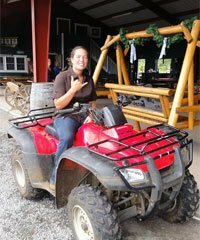 There have been 3 reviews written about the Waterfall & Rainforest Trail with ATV Outfitters Hawaii. We enjoyed our tour with ATV Outfitters. It was fun and adventurous and something we had not done before. The guides are very safety conscious and want to make sure that everyone can handle driving an ATV before going out. We appreciated the practice course prior to heading out. I would use ATV Outfitters again and recommend them to others. Excellent ride. Jr and Austin were great guides. Fun ride but quite the workout. Hated missed some beautiful scenery while going to fast to enjoy the ride.